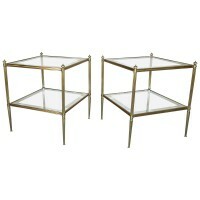 A beautiful pair of French side or end tables with inset glass tops with mirrored edges. Solid brass fittings are nicely detailed with a warm overall patina. Measures: 19 1/2″ square X 22 5/8″ H to top of finial. 21 3/8″ H to top of shelf.